This date is the easiest of all the different date size changes to distinguish. 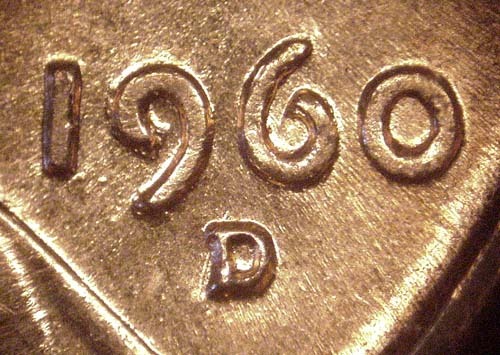 The following outlines only some of the many differences between 1960 large and small date cents. Because the mintmark was placed into each die individually by hand, do not use the mintmark position as a measure of whether you have a large or small date coin. 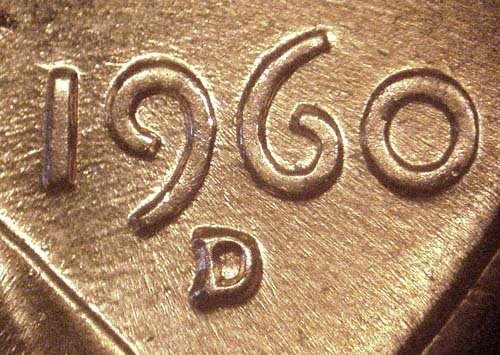 Each die, both large and small date, will differ in exactly where the mintmark is placed. The inner loop of the 9 is much smaller on the small date. The upper part of the 6 digit is straight up and down vertically with the outside of the loop on the large date. On the small date, the upper part of the 6 cuts short of being vertically even with the lower loop. The zero is much smaller on the small date. The top of the 1 and 9 digits are horizontally level on the small date. The 9 is taller than the 1 on large date coins.